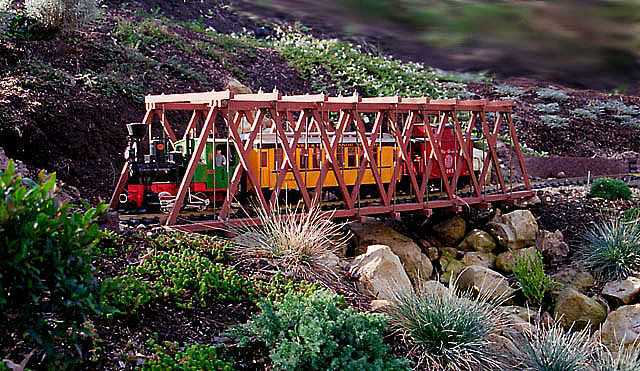 As you might have seen from my other pages, I've scratch built a few Howe Truss bridges. The design is only a loose representation of a real Howe Truss, but it is functional and very easy to build. I was attracted to the design by the tie rods, they add a complexity that I found appealing. The design uses only a few types of materials and most of them are cut to only a few sizes. The entire structure can be built using only hand tools. This paragraph is quoted from "Train Wrecks" by Robert C. Reed. 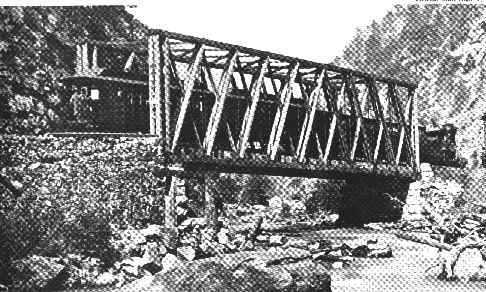 "From 1840 to about 1870 the standard railroad bridge was the Howe truss, a rectangular trussed frame of wooden diagonals and vertical iron tie rods. 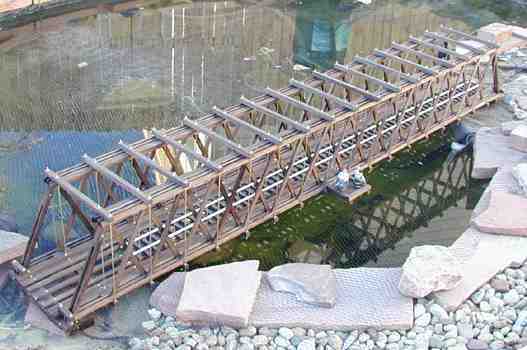 This bridge was invented by William Howe, a farmer turned inventor. According to Lucius Beebe, the Howe truss was probably responsible for as many railroad deaths as any other single cause. 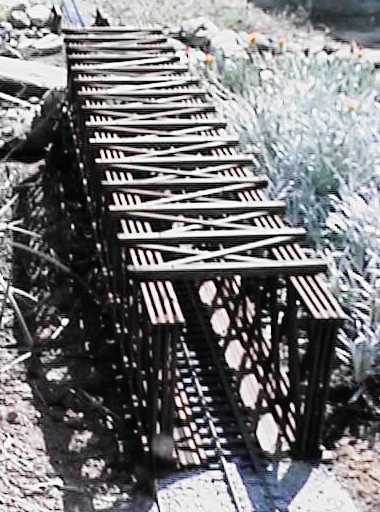 Although the engineering and construction of these truss bridges was probably not always the cause of their failure, there is no doubt that they were particularly vulnerable to floods, fire, and decay. They required constant inspection and repair. Also a number of bridge collapses can be traced to derailed trains striking the timber trusses and weakening the bridge enough to cause it to fail." This is a photo of a Howe truss somewhere in Colorado in 1870. My modeled version is similar to a real Howe truss but considerable simplifications have been made to allow easy fabrication. I take advantage of the fact that the stress/strain characteristics of materials do not scale so that I can get away with structures that would never hold together at 1:1 scale. Since the track just sits on the stringers, the bridge will accommodate any kind of track, handlayed or prefabricated, with any tie spacing. The load path of this bridge is pretty complicated. 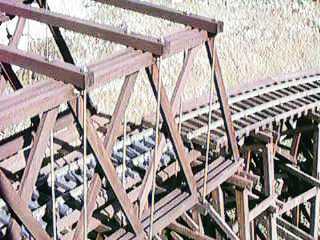 The ties are supported by stringers running the length of the bridge. 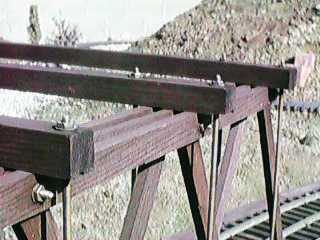 The stringers are supported by the lower cross beams. The lower cross beams literally hang from the tie rods which in turn hang from the upper cross beams. 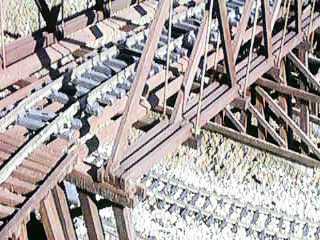 The upper cross beams are supported by the trusses which transfer their load to the abutments at the ends of the trusses. The entire structure is held together with threaded brass rod and escutcheon pins. No glue is necessary anywhere and none of the escutcheon pins are in tension or shear. The length of the truss is scalable in 4-1/2" inch increments, just make the upper and lower beams as long as necessary to meet your requirements. The width of the truss is also scalable, the diagram below is adequate for a single straight track. 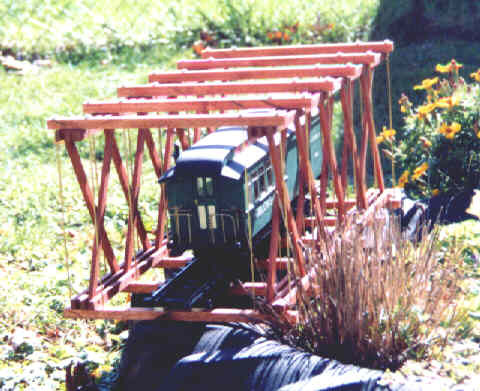 You can make the cross beams longer to accommodate double track or curved track. Inside height clearance is 8" inches from the railhead, enough to clear the tallest Large Scale rolling stock, even a Bachmann Shay. 1/4" x 1/2" redwood for the truss beams, diagonals, stringers and walkways. If you can't find brass hardware locally, you can order it from an industrial material supplier like McMaster-Carr Supply Company. I found brass nuts in their Internet catalog (p/n 92671A004) for $1.59 for a bag of 100. The brass rod and washers are in the catalog as well. I found the escutcheon pins at a local homeowners store (OSH). This photo shows how the pieces go together. I use 3/32" rod as it is readily available at hobby shops or welding supply stores and its just a little smaller than the ideal size for #3 hardware so its easy to thread. If you want to use a more common hardware size such as #2 or #4, you'll have to get rod of the appropriate size. To prevent the corners of the diagonals from sticking above or below the truss beams, I use a belt sander to trim off the corners before staining. I cut and drill all my wood before any assembly. I then dunk it in stain so that all surfaces, including inside the holes are coated. Redwood soaks up stain very well. After the stain has soaked in and dried, I assemble the trusses. Then I install the cross beam and tie rod structures around the trusses. Be sure to use washers as the soft wood won't take the load of a nut by itself. I then tighten all the hardware. The stringers and walkways are pinned to the lower cross beams with 1/2" #18 brass escutcheon pins. This photo shows a little better detail of the joint. A short rod goes through three truss beams and two diagonals. At the ends of the truss were there is only one diagonal, a short piece of 1/4" material is used as a spacer. You'll want to measure the actual thickness of your stock and add 1/4" to determine the proper length of your truss pins. I don't attach the end lower cross beams to the truss. The truss and the ends of the stringers simply rest on the beams which are attached to the abutments. This allows the structure to be removed easily. You can make your truss square like the lead photo, but dealing with the end posts can be a little difficult. I solved this problem by making the truss end in a diagonal. The structure is amazingly strong considering the weight of the materials involved. Redwood and brass hold up very well out of doors, my structures get soaked every morning by the sprinklers and after a year they are none the worse for wear. I've received lots of reports of people building bridges based in the plans in this page. Some have even sent pictures, most of which I have misplaced. However, if you want to show off your handiwork, send me a picture and I'll post it here. John Hampton, 68 years young, built this one. From the picture, I would guess that he built the bridge before he built his railroad. In any event, he treated the ends differently from mine. Jon Foster built this 6 footer. He says it supports his 42 lb son at the center. "George, here are some pictures of the Howe Truss I built from your plans. The length is 72" which works out to be about 120' in scale footage. Not very prototypical but it works fine in G scale. The structure is made from Redwood I bought from Garden Texture in North Carolina. I stained it with outdoor redwood stain from Home Depot. I got all the brass from McMaster-Carr and blackened it with liquid brass blackener. I made several jigs to cut and drill the wood which I bought in 6' sections. I built the whole thing in about 20 hours and it went together very nicely. The worst part was threading all those brass rods!! The locomotive is a Live Steam Geoffbuilt Backwoods Shay built by Geoff Coldrick in New Brunswick, Canada. 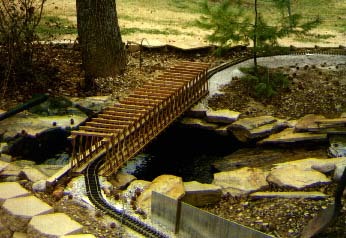 I had built a truss bridge, slightly over 7 feet long, based on your drawings but modified a bit. If you look closely at the photo you can see the additional length wise beams added to the structure. You can also see the additional side support been added to the end. I also mentioned I added "wings" and you will see that as well. I think you may like it. You can see the #3 nuts and washers used to "lock" the structure together with the additional beams. If you remember, I also mentioned this bridge held my whole weight of about 155 lbs. I finally got it together and took this picture of the bridge I built using your design. I think that it looks pretty good for my first attempt. 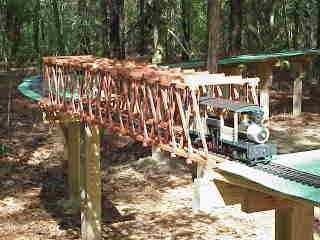 Now I have to build a bunch of trestles, do some more digging, lay some more rocks, planned some landscaping, etc, etc. I built the Howe truss bridge in the attached photo many months ago, but just got around to putting a photo in digital form a few weeks ago. The bridge always draws raves from visitors. Dean Whipple when wild beefing up his version. The trusses are double thickness and the top and bottom beams are crossbraced as well.